Stainless Steel Pull-Out Spray Kitchen Faucet with Deck Plate Accent your kitchen by adding this stylish yet durable Vigo faucet. Stainless steel finish with matching deck plates all solid brass construction which ensures durability and longer life. 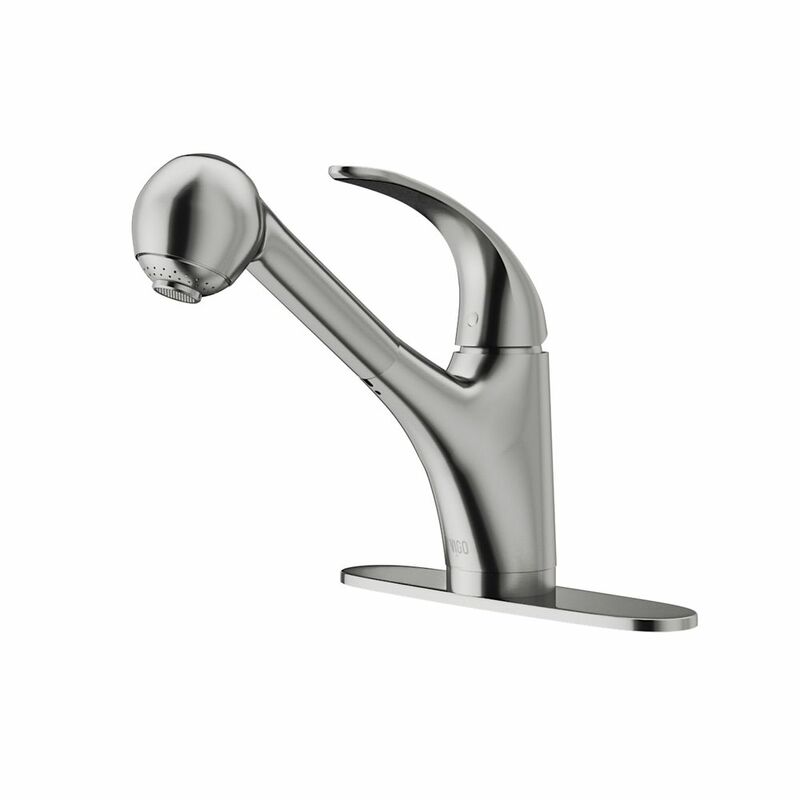 Faucet features dual pull-out spray head for aerated flow or powerful spray. Includes a spray face that resists mineral buildup and is easy-to-clean. Stainless Steel Pull-Out Spray Kitchen Faucet with Deck Plate is rated 4.4 out of 5 by 60. Rated 5 out of 5 by amisme from Functional beauty! I love this faucet. It looks very good without needing the clearance of the taller pull-out models, it's easy to use and feels very sturdy and well made. While it was not easy to install, that was more the fault of the cramped corner installation than the faucet itself. The water flow rate is excellent, and I expect to be enjoying this beautiful addition to our kitchen for a long time. I liked it so much, I bought another for my daughter's kitchen. Rated 4 out of 5 by Han from The faucet had arrived much earlier than estimated which is good. The material is better than oth... The faucet had arrived much earlier than estimated which is good. The material is better than other faucet in this price range. What we do not like about the faucet is the lack of instructions. There were only a few steps on a piece of paper, so vague and not useful. Had to get the laptop out and go to YouTube to find a similar repair video format this faucet. If you are not going to include good instructions at least mention a link to an online how to repair video so that it can be a lot clearer.